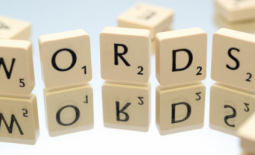 Let me tell you about a B2B business which was meeting with two digital marketing companies who offered search engine optimization (SEO) and paid search campaign management. The two digital marketing companies were pretty different from each other; one was a single location local business and the other was the digital division of a large national media company. There were pros and cons to choosing one over another and the B2B business interested in hiring one of them went through an initial needs assessment meeting, first proposal review, revised proposal review, and a final presentation with each company. The smaller company’s pricing was actually higher and seemed to have more up-charge elements to potential add-on services the client might need as time went on, but they would deal directly with the key personnel, had access to the owner, and were transparent in their process. The larger media company had a lower flat-rate price with everything seemingly included, along with a cool project dashboard to monitor campaigns and the work they did, but access to key people would be filtered through the sales rep and many times the rep didn’t have answers to why their company executed a campaign differently than the way the other provider was suggesting. Still, both companies had made a positive impression and both were still in the running for the contract. As a matter of fact, the B2B company allowed the rep from the large media group to submit a second proposal based on the higher amount the smaller company had quoted — just to keep the playing field level! Obviously this prospect was not going to buy on just price alone. The second proposal was received and reviewed and it was still looking like a tough decision. The B2B company even joked about flipping a coin to decide! 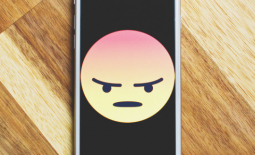 The smaller marketing company had provided contact information for a few of their clients so that the B2B company could call or email them and get feedback on what it was like to do business with them. When the large media company was asked for similar contact references (again… level playing field…), the sales rep tried a textbook sales close (boo!) that was almost embarrassing. The rep then said he’d “try” to get some references, but in the meantime provided a video link to a few recorded testimonials. The rep from the big media company never got back to the B2B company with any further word about providing references the prospect could actually contact (but he certainly didn’t miss sending the follow-up email to “check on the decision” a day or two after the date the B2B company had originally given for making their decision! 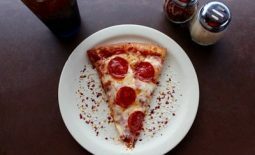 With all other things being equal, the B2B company went with the smaller (more expensive) local provider because of the difference in transparency of real access to real customer feedback. The clumsy and salesy attempt to close the prospect when they were asking the larger media company for reference information which should have helped them differentiate themselves in the long run just made the decision easier. Ironically, when the large media company asked about the decision, the B2B company told them exactly how and why they decided to go with the other company. The sales rep had CC’d their sales manager on the email, so the B2B company sent their response to both parties as well. The B2B company even invited the large media company to stay in touch and keep them updated on new services and marketing opportunities in case the current situation changed. As of this writing, neither the sales rep nor the sales manager has responded to the feedback (or the invitation to stay in touch). I have personal experience in many roles; speaker, consultant, salesperson, sales trainer, marketer, and customer loyalty advisor, but I think I am most amazed at this situation in my role as CUSTOMER. There are lessons here for every sales professional to learn from. How often does the prospect from a sale that you lost give you insight into the exact thing that separated you from a YES? How valuable is this information? …and they didn’t respond at all?? I would have sent a big box cookies and muffins and a card that said “thank you SO much!” That information could be worth thousands (millions!) of dollars over the course of that sales rep’s career. After hearing the story and considering the opportunity, I thought I’d add to the value provided by that B2B company and do a brainstorm on a dozen different ways anyone in sales could choose to follow-up with a prospect who just told them NO. 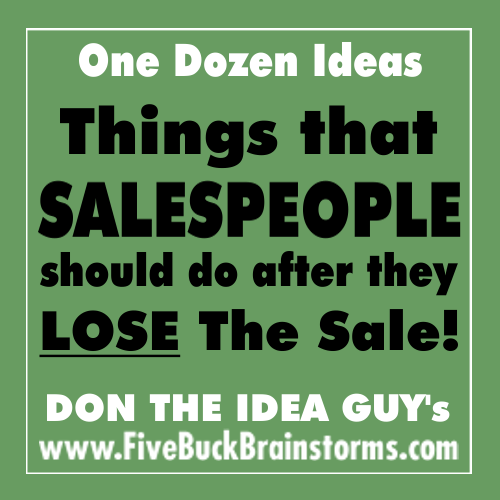 This new Five Buck Brainstorm includes ideas for strengthening the rapport with that lost sale and setting the stage for future opportunities and future business. I hope you’ll download the new brainstorm today and give a few of these ideas a try. You already lost the sale! 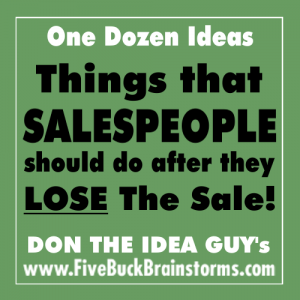 Click here to download the new “Things Salespeople Should Do After They LOSE The Sale” brainstorm.